Yavatmal DCC Bank newly posted the notification of YDCC Bank Recruitment 2019. It has given this notice due to 147 Junior Clerk, Sahayak Karmachari (Sepoy/Peon) Vacancy in Yavatmal DCC Bank. These will be filled by the candidates who filled Yavtamal DCCB Online Application Form in www.ydccbank.org from 13th March to 1st April 2019. All Degree holders and 10th class passed contenders are invited in the Yavatmal DCCBank Junior Clerk Notification. A person can apply for both the posts if they are eligible for both designations. But they have to submit two YDCC Applications separately for each post. Bank aspirants we have found a new Bank recruitment that gives you the best career offer. The new bank recruitment is released by Yavatmal District Central Cooperative Bank (YDCC Bank) titled as YDCC Bank Junior Clerk Recruitment 2019. Let’s see the bank requirements first and then take the decision of sending your details through the application form. Unless not following the requirements or guidelines if you do the registration it is of the waste of time and money. 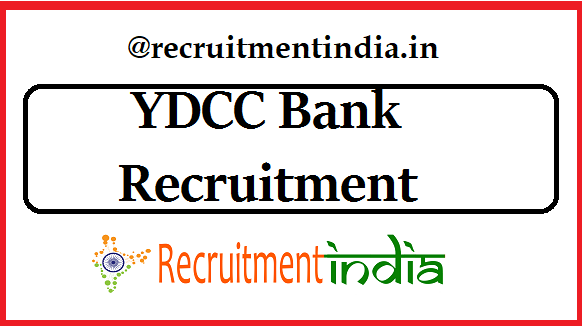 To do the registration of YDCC Bank Recruitment 2019 the primary section to be referred by the willing candidates is the eligibility criteria in which the post wise educational qualifications and age limit are discussed. In the YDCC Bank Recruitment 2019 notification job, chances are given for any kind of degree holders and 10th class passed individuals. In the elaborated manner post wise academic qualifications are addressed by our recruitmentindia.in team for a clear understanding of the job seekers. Misunderstandings or mistakes in knowing the conditions of YDCC Bank Junior Clerk Recruitment should be done by any one of the competitors. If they do the mistakes, the effect will be on their participation in the selection rounds only. Entry document for the selection rounds will not be given in case the applicant not follow the rules. Yavatmal DCC Bank recruiting mainly two designations. The qualifications of those posts are given post wise. Both the vacancy have the same age limit criteria. YDCC Bank will offers the posting letters to only those candidates who have qualified with merit marks in the following selection rounds. Total Yavatmal Vacancy is 147. The amount of Rs. 1000 has to be paid by all category of applicants as the application fees. Once paid application fees will not be refunded at any cost. The bank officials only for the clear view of Yavatmal DCCB Recruitment Of 147 Junior Clerk, Sahayak Karmachari (Sepoy/Peon) vacancy prepared the long advertisement by stuffing the full details about it. As the officials are discussed the important details with you then you have to neglect the reference of Yavatmal DCCBank Notification of 147 Vacancy. These 147 vacancies are present in the Junior Clerk and Sahayak Karmachari (Peon) posts in various branches of Yavatmal District Central Cooperative Bank (YDCC Bank). If there is any problem regarding the relocation for a job, postulants have to decide before attending the recruitment rounds only. Check where the YDCC Bank branches are located in India. Fortunately, if you got selected finally your place of posting will be in any one of the Yavatmal Bank branches. There will be no choice to chose your preferred location. Contenders whoever okay with the eligibility criteria, posting location and salary details go through Yavatmal DCCBank Online Form link updated under the important links section. Two weeks time is allocated by the bank for finishing the entire registration details. 13th March is the date on which the application is already opened. The application form is going to be inactive until the end of 1st April 2019. www.ydccbank.org Junior Clerk Application Form tried to be filled on or before 1st April 2019. Application fees payment the last date is 30th March 2019. Common registration fees to all the applicant that has to be paid successfully by the applicants who are enrolling to attend the YDCC Bank Recruitment 2019 process. Syllabus of the exam will post soon.